In the years before the Civil War, the Northern states blossomed into thriving industrial areas. Factories produced goods, such as furniture, clothing, and tools, which were shipped to the West, as well as to other countries. The Northern states were becoming wealthy. People came to the cities looking for jobs, which slowly increased their prosperity. More people could attend school and be educated. In contrast, the Southern way of life hadn’t changed much. Thanks to rich soil and warm climate, farming remained the main industry. Most people lived in rural areas and New Orleans was the only large city. Although relatively few Southerners owned slaves, those that did had social and political control of the South. Poor farmers looked up to plantation owners. 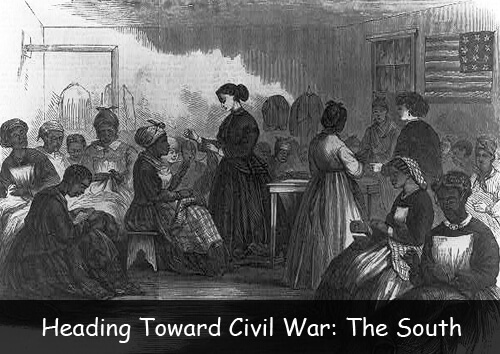 Increasingly, the North and the South were divided – economically, culturally, and over the issue of slavery. Plantations were large farms that usually grew one crop, such as sugar or cotton. Plantations were almost like miniature towns. A plantation might have the family plantation house, slave quarters, ice house, smoke house, blacksmith’s shop, a dairy, and a cotton gin. The plantation owner’s children were educated at home by a tutor. Slave owners believed that keeping slaves was okay because great ancient civilizations like Greece and Rome had practiced slavery. Some slave owners treated their slaves well; many slave owners treated their slaves cruelly. Husbands and wives could be sold and separated from each other. Children were considered the property of the slave owner and could be sold away from their parents. Plantation owners relied on slave labor to run the plantations. House slaves cooked, cleaned, and cared for the children. Field slaves worked very hard for many hours each day. Slaves weren’t allowed to learn to read or write, but they told African folk stories and sang old favorite songs. Slave owners introduced Christianity to the slaves, who related to the story of Moses leading his people to freedom. Slaves developed their own form of religious worship, which mingled Christian views with their old African beliefs. After the invention of the cotton gin, plantation owners began planting more and more cotton. They needed more slaves to work the fields, harvest the cotton, and process it. Question: What was life like for white Southerners who didn’t own slaves? Answer: We tend to think of wealthy plantation owners when we think of the Old South, but only 30 percent of the population owned slaves. Most white men were farmers who lived with their families in humble homes and farmed a few acres of land. Visit Scholastic to learn more about what life was like for slaves. Declan, Tobin. " Civil War Slavery Facts for Elementary Schools ." American History for Kids, Apr 2019. Web. 21 Apr 2019. < https://www.americanhistoryforkids.com/heading-toward-civil-war-south/ >.